In 2010, we introduced SmartTagging for smarter dashboards, allowing to categorize Netvibes content using your own labels (combining both a description and a sentiment) and share your thoughts and expertise with others. Today, tagging component has been refreshed in Netvibes native reader. Now, when you read articles, you can bring up a new Opinion editor that helps you tag things super quickly, by offering you As-You-Type Suggestions. New component, new name. Opinions are available on VIP and Premium dashboards. For example, you can flag articles to read later, classify important articles together, mark items as “Threats” or “Opportunities” or anything else you like. 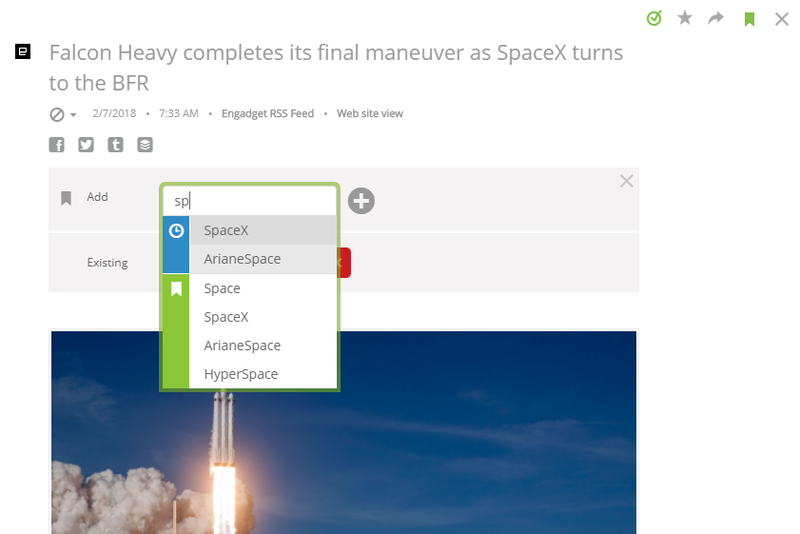 As a reminder, you can easily find all your tagged articles by searching in the Universal Search box and typing the “Opinion:SpaceX” search command. To learn more about Opinions, or discover how Netvibes insights can drive your business forward, please contact us for a free demo. From all of us at Netvibes, we wish you a very happy and successful new year! Whatever your professional and personal goals are for 2018, your Netvibes dashboard can help you monitor the information you need to know, act immediately based on real-time insights, and track your progress over time. Contact us for a free demo and explore how Netvibes insights-driven decision making can help drive your business forward. What are the fastest-growing tech topics in France and Silicon Valley? Which technologies will drive new economic models? If you’re in Paris on November 8, join us for a Bpifrance breakfast event. Netvibes will present a new analysis of Top Tech Trends, comparing Silicon Valley versus the French ecosystem, with data insights delivered by Netvibes. Netvibes has analyzed thousands of articles and posts by influential tech figures in France and Silicon Valley in order to identify the key technologies that will impact us tomorrow. This presentation will include all new analytics, examining the evolving trends and diving deeper into the top 6 most-popular topics. We will also expand on previous research done by Netvibes and Bpifrance to analyze technological trends on both sides of the pond. Read our Business Case for more details about the previous projects. The breakfast presentation by Netvibes CEO Freddy Mini will be followed by a roundtable gathering, where experts in each of these technologies will share with you their vision and predictions for the evolving market. Registration is required to participate in the event, which will be conducted in the French language. We hope to see you there! Today is Netvibes’ 12th birthday, and to celebrate we are giving away one-year VIP passes to 12 of our loyal users. Want to be one of the lucky dozen? Enter to win below! In the life of any student, staying on top of competing commitments is tough. That’s why Netvibes is here to help! Create Potions and customize automatic actions to save time, get more out of your studies, and prepare yourself for all aspects of your busy life. File Transfer Protocol is a fast and convenient way to transfer files over the Internet. This is a very common practice in the world of open-source and freely distributed software. Today we have added a new FTP ingredient to Netvibes Potions, so you can automate your files transfer from your Netvibes dashboard. YouTube is the most popular video-sharing network that allows online users to upload, view and comment on videos and subscribe to other users. Today we have added a new YouTube Ingredient to Netvibes Potions, so you can automate your YouTube channel and act on the video platform directly from your Netvibes dashboard. Automate your WordPress blog to reach wider audiences and produce more content. It’s easy with our new WordPress Ingredient for Netvibes Potions. 2017 UK General Election: What happened to Theresa May? Netvibes Dashboards aggregate and analyze data to deliver real-time insights into markets, brands or any topic—including political elections!—in order to drive better decision-making. Over the past year, the Netvibes team has created custom dashboards to analyze the 2016 US Presidential Election and the 2017 French Presidential Election. Now it’s the United Kingdom’s turn.